In 1968, Burt Lancaster starred in Eleanor and Frank Perry's adaptation of John Cheever's short story, The Swimmer. Despite a troubled production, including a lot of re-shot scenes and alterations after the director was removed from the picture, a smart and beautifully artistic film somehow managed to come out of the process. ...not that being a smart, beautifully artistic film is all that suited for box office success. So the film has quietly lived on just as a small cult film - a cult film ripe for a rediscovery via a 2014 lavishly restored special edition blu-ray from Grindhouse Releasing. 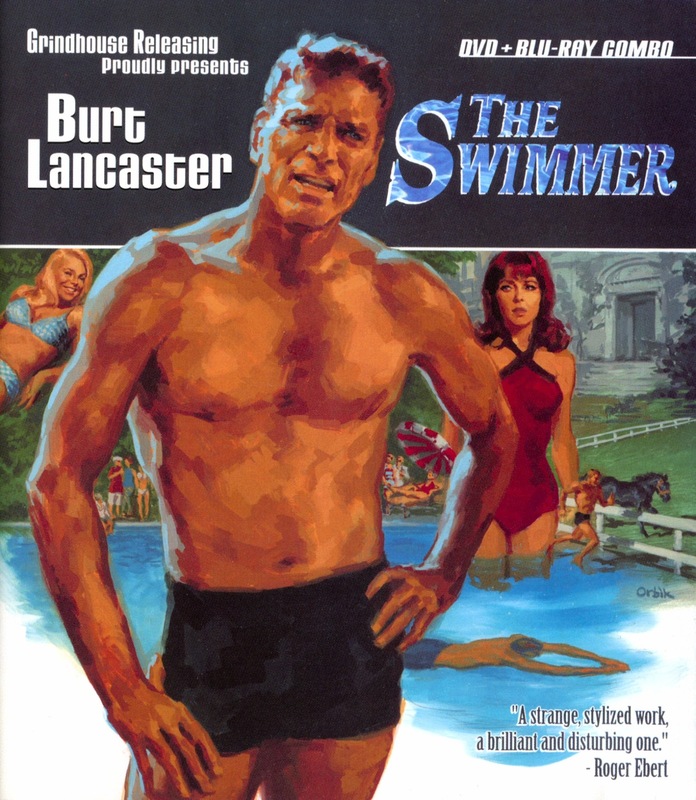 The story is an almost surreal, not entirely literal tale of a man, Lancaster, who surprises his distant neighbors by showing up at their backyard swimming pool. 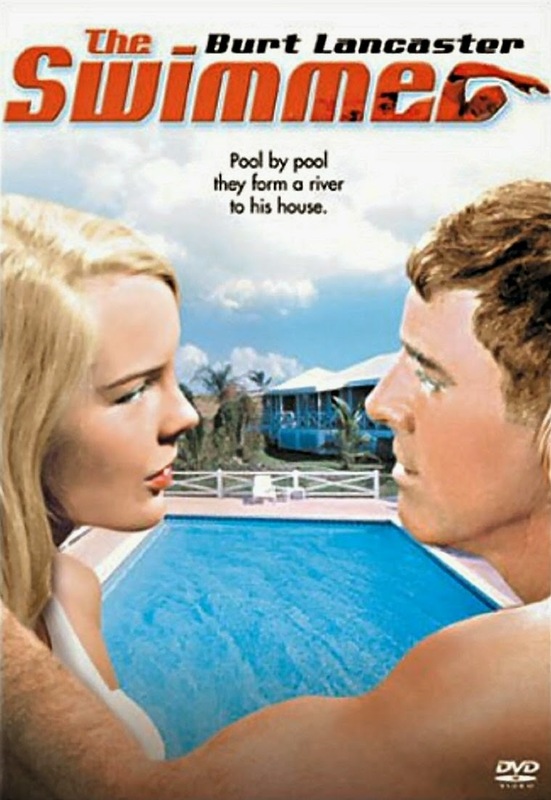 While reuniting, he realizes that the landscape of his upscale county has become so full of swimming pools that he can swim all the way home. He names it the River Lucinda, after his wife, and declares himself a noble and splendid explorer traversing a river of sapphire pools to his home and family. But as he makes his way nearer and nearer to his home, he encounters people closer and closer to him in his life, and has to face some very dark and painful truths. A problem most literary adaptations have is that a novel is way longer than a film, so a lot - the overwhelming majority even - has to be cut out, unless you're afforded the luxury of a mini-series or something. A short story or novella is about the perfect length for a movie. But The Swimmer has the opposite problem; it's too short. It's a quick, breezy little read that was originally just a quick fiction piece in The New Yorker. But it turns out not to be a problem, as the film is fleshed out so richly, it actually adds a good deal more strength and substance to the original story. Going back to it after seeing the film makes it seem a little light and pale in comparison. From the changes to the original story to the changes by meddling producers and even Sydney Pollack (who was hired to reshoot scenes the producer didn't like after Perry was fired), it's hard to imagine any detail of this film wasn't always meant to be, because it's so fitting and effective. Now, to be fair, this film isn't exactly making its DVD debut here through Grindhouse. Columbia Tri-Star released this film in 2003 in the US and the UK. And they even gave it an anamorphic, widescreen presentation. But they certainly didn't give it the special treatment Grindhouse has, either in terms of extra features or their new 4k scan. And of course, it's long out of print, though still readily findable online. So let's have a look at how the two stack up against each other. 2003 Columbia DVD on top; 2014 Grindhouse blu-ray on bottom. Both are framed nicely with just slight letterboxing to 1.85:1, although there's slightly more vertical information in the new Grindhouse scan. It's certainly a nicer, cleaner image on the blu... the biggest difference is that the DVD just looks murky. Look at that top image, darker, blander colors. It's also a single-layer DVD (as opposed to Grindhouse's dual-layered blu), so the extra compression gives the old DVD even more of an electric pixel-y feel in motion. The colors are also warmer and more attractive on the blu, and scratches and damage has been cleaned up - look at that white fleck on Cornelia Skinner's lip in the second shot. Grindhouse presents the film with it's original mono audio in DTS-HD, while Columbia had a standard Dolby 2.0 track. Grindhouse's release is also a blu-ray/DVD combo pack, so just for the record, here's a comparison shot of the Grindhouse DVD, so anyone who hasn't gone blu can see what they'll be getting. Of course it's the exact same transfer, just in standard definition, and still quite an improvement over the old disc. Grindhouse handily trumps the competition in the extras department, too. Columbia Tri-Star only had the theatrical trailer and bonus trailers for a couple other Lancaster films: From Here To Eternity and The Professionals. 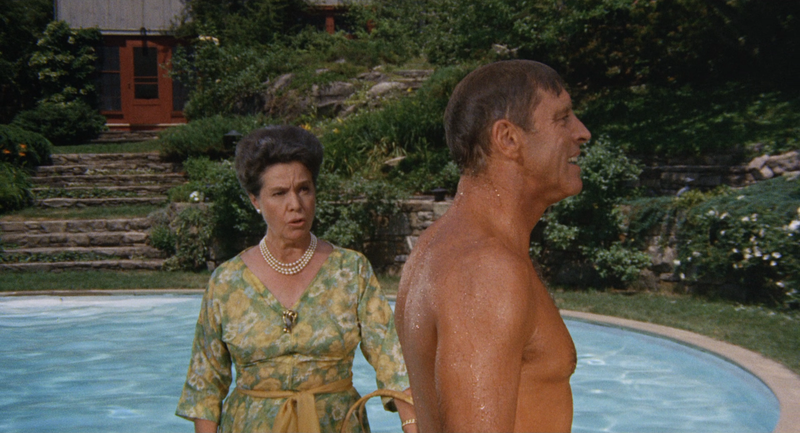 Well, Grindhouse not only has the trailer, plus five TV spots, six bonus trailers for other Grindhouse titles and six photo galleries, but, well... the main thing is a huge, two and a half hour documentary about The Swimmer. It's lead by assistant directors Michael Hertzberg and Ted Zachary, who have a ton of first-hand information of everything that took place on location, even the behind-the-scenes drama. Joanna Lancaster speaks both for her father and from her own memories of being on set. It also features actresses Janet Landgard, Joan Rivers (who, as you can imagine, has a lot to say despite her small role) and Marge Champion, composer Marvin Hamlisch (oh, did I mention that this film has a sublime score as well?) 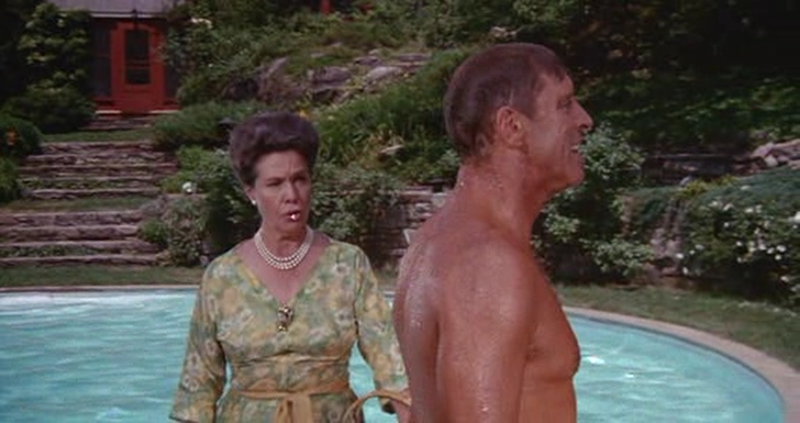 and even Burt Lancaster's swim coach Bob Horn. It doesn't leave any questions unanswered. Still, there's more, including an extended interview with Marge Champion. We saw clips of it in the documentary, but here we see the whole thing, where she's interviewed by filmmaker Allison Anders (Gas, Food, Lodging) more about the rest of her life and other films she worked on, including an audience Q&A. Then there's a collection of outtake footage from the opening credit sequence - you can watch them try to get the rabbit to run in the right direction through the woods. The entire film is also given an isolated stereo music track. And last but not least there's a full audio recording of Cheever reading his original story, where you can really appreciate how faithful yet enriched the film was. Oh, and there's a booklet with liner notes by Chris Innis and, believe it or not, Stuart Gordon. I guess this movie isn't standard fare for Grindhouse, but then again, it really isn't standard fare for any studio. It's a rather unique and terrific film. And while it wasn't exactly non-existent on DVD before (which, sadly, is still very true for a number of films), it's only now been given the respect and treatment it deserves. This is one to add to your collection whether you owned the old edition or not.